We scoured issues of Good housekeeping and Bon appetite and yet we weren't able to find any good recipes for spooky potions for you to mix up this Halloween. So we had to take bits and pieces of potions for literature. This being said, we're not sure exactly what kinds of magic this will whip up. It could end in disaster, it could end in fame and fortune, and it could just end in a big mess. Either way, we're curious to see what happens when you put these ingredients together. So first, add a little holy water. Then a pinch of lavender and ginger. Thirdly you'll want one bat wing and one vial of dragon's tears. Umm, wait, you don't have access to either of those ingredients. We don't want to even ask about newt's eyes, we like amphibians too much. Maybe you should just pop a fog machine in this black cauldron and watch the magic happen, no magic animal parts needed! This black cauldron has a large handle and feet to keep your cauldron steady. Fill the fourteen-inch cauldron with candy or add some spook to the atmosphere with black ice or a smoke machine. Are you ready to add some atmosphere to your Halloween party? This cauldron will add a little more spookiness to even the cheeriest apartment. 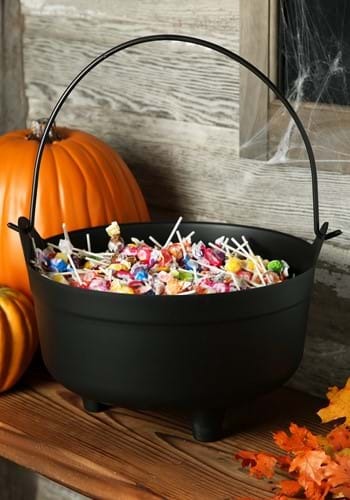 You might not have invested in bat wings or dragon tears but this cauldron is sure to make your place look just like a witch's lair!